This music was performed and recorded multi-track by the author using a variety of electronic equipment, including synthesizers, digital instruments, and effects. All excerpts, articles, images and original music Copyright © 2008-2019 Richard Merrick or their respective owners. All Rights Reserved. The New Fusion Project is what I call my home recording studio and record label. I started out years ago multi-track recording all the instruments and vocals from some of the bands I admire, teaching myself how to recreate their different recording styles. 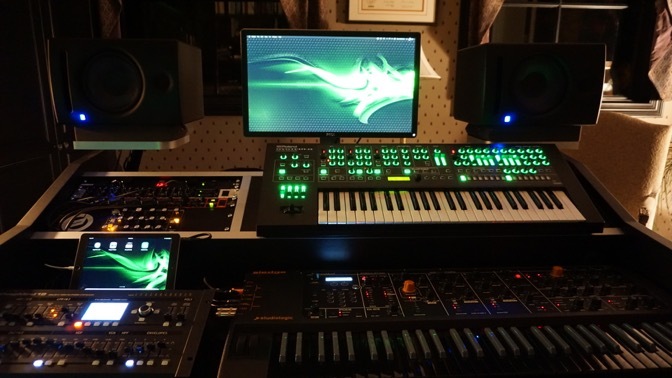 Over time, I added more software and outboard gear to construct a fully networked synthesizer lab in my home office. 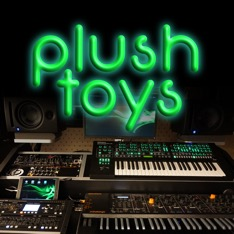 Synthesizers now include a Yamaha Motif, Moog Minitaur, Roland System-8, Behringer Deepmind 12, Studiologic Sledge 2.0, a NI Maschine Mk3 drum controller and a large library of soft synths and instrument samples. Dream With Me, original dream-pop. Time That Never Ends, original jazz fusion. Deep With You, original world-jazz fusion. Daybreak, original piano jazz fusion. Ponder Awhile, original jazz piano fusion. Ask Alexa, original storyscape inspired by Amazon Echo. Majesty, original improvised romantic symphonic movement. Social Control, original prog-rock by Rich Merrick, Rusty Smith & Norris Lozano. Your Style, original fusion jazz by Rich Merrick & John Perez. Eruption | Stones of Years, ELP from Tarkus. Us And Them, Pink Floyd from Dark Side of the Moon. Yours Is No Disgrace, Yes from The Yes Album. Killer Queen, Queen from Sheer Heart Attack. Madness, Muse From The 2nd Law. Explorers, Muse From The 2nd Law. You Make It Easy, Air From La Femme d'argent.